Posts | Max Tack | DEDICATED TO QUALITY AND CUSTOM MADE EQUESTRIAN PRODUCTS. DEDICATED TO QUALITY AND CUSTOM MADE EQUESTRIAN PRODUCTS. As a member of a Mounted Search and Rescue group we take different courses and seminars. At one recent course the question of what emergency items to have with you came up. One member mentioned they thought a valuable but often overlooked item to have is a whistle. While hiking with friends the next week the same discussion came up and we all pulled out whistles that we had in our packs. I then mentioned we really didn’t need them as all our packs had snap buckles that were whistles. They were unaware of this. If you have any packs or items you ride with, either on you or your horse, check to see if they have this type of snap buckle. Nice to know you have one in an emergency. Hay is expensive this year! Here’s what we found that is inexpensive, safe, saves money on hay and is healthier for our horses. There has been a lot of talk about “slow feeders” for feeding hay. Here’s one article. Horses that spend a lot of time in a stall or run and are fed hay a couple of times a day can get bored and waste a lot of hay. There are many types of slow feeders now available. Recently we purchased some small mesh hay bags from Dover. Dover Mesh Bags website. We didn’t want to spend a lot of money but wanted to give the concept a try. They work great! It takes longer for our horses to eat the hay so they seem more satisfied and less bored. The hay also stays contained better so they are not spreading it around stomping around in it and peeing in it. Our hay consumption has definitely decreased so we’re happier and our horses are happier and healthier also. 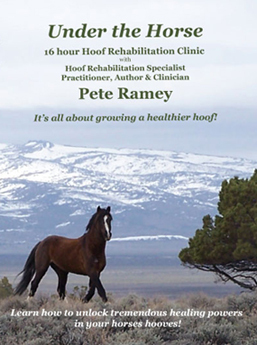 Watched 16 hours plus of Pete Ramey DVD’s. Good stuff. Pete Ramey’s Website. At a recent riding clinic a signed up participant arrived disappointedly without her horse. Her comment was, “My horse just didn’t want to load today.” We had a good discussion trying to determine what the problem was. There are two basic issues here. One is trailer loading. Is your horse trained to LOAD into the trailer? This alone is the subject of many articles and chapters in books. But that’s not what I want to discuss here and not what we thought was the problem with her horse. The second issue is keeping your horse happy in the trailering environment. This is something that is not as well talked about but is as, if not more important than will your horse load. You may be able to load your horse but making a hospitable place for them to be will keep them loading without fear. Long hauls vs. short hauls require different discussions also but now I am just thinking about keeping your horse comfortable for the short trip to a clinic, event or trailhead. Here are some ideas about determining if the trailering environment is a comfortable place where your horse wants to be and won’t try to avoid. Number 1. How do you drive? Many years ago my wife and I wanted to see what it was like for the horse riding in our trailer. We took turns driving and riding in the trailer with one of our horses. It was eye opening. It took significant effort for the horse to stay balanced. We drive with the idea that there is a full cup of coffee in our cup holder and we don’t want it to spill. This determines how we accelerate and brake and especially how we make turns. We make sure our horse has the room and the ability to move, spread its feet and shift to keep its balance. This brings up the issue of “to tie or not to tie.” This is a subject of which there are many pros and cons, too many to be discussed in this brief blog but important to research if it is something you are concerned about. Read the answer to my question about this in the Hitch Up Magazine. “To Tie or Not to Tie?” article in Hitch Up Magazine. 2. Another aha moment while traveling in the trailer with the horse was the noise. We had a divider that was rattling badly. Of course the horse was used to it but you could tell it made for some discomfort. Try to muffle sounds that annoy your horse. 3. Then there’s the footing. Horses are very sensitive to what’s under their feet. The main thing we have determined to be careful of is the flooring becoming slick so the horse does not feel secure. Again many ways to solve this with matting, shavings, booting etc., but something to be aware of so the horse does not have a fear of its footing. Some horses like to pee or poop in the trailer which is good and bad. They find it an appropriate place to relieve themselves without the stress of “holding it.” But care must be taken to again make sure their footing is secure. 4. VENTILATION!!!!!! Most trailering is done in the nice warm weather. Trailers can heat up fast. Does your trailer have the ability to be ventilated? Do you open the windows and vents? Stories are out there about dogs being left in cars that get too hot. Well that goes for our horses also. This can not be stressed enough!!!! Insulated roofs sometimes are necessary for those frequently traveling in hot weather and slow traffic conditions. 5. Feeding your horse in the trailer is another issue that has its pros and cons. 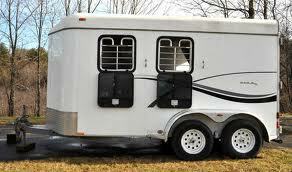 We feel that allowing your horse to eat in the trailer adds to the environment being more acceptable. 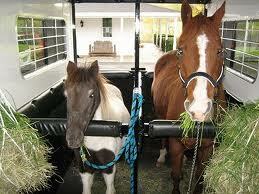 When teaching our horses to load we often just let them stand and eat in the trailer without going anywhere. Our horses seek out the trailer as they know there is food in there. Loading the horses is not the last thing we do when going for a ride. Before we drive off with our horses in the trailer we let them stand still and eat while we do our last minute things before leaving. 6. Hydration is important, more so for the long haul but even on the short haul giving the horse an opportunity to drink before loading is advisable. Two buckets of water with covers always ride in the bed of our truck. Some horses won’t drink but for those who will the trailer is not the place where they fear they will stand and be thirsty. Have you noticed in any parking area where horses are being loaded there is always an audience with one eye watching. It’s like watching NASCAR to see the crashes. Will that horse load? And for us who are loading, it’s “please don’t embarrass me and load easily.” Thankfully our horses seek out the trailer as a comfortable place. Here’s hoping yours do also. This post has been mulling around in my brain for a while. Then on a recent trail ride the gaiter of a backcountry boot on my wife’s horse looked a little loose. Sure enough one of the screws had worked itself out. The screw was gone! I carry a leatherman multitool in my pack and secured the other screws and we were able to complete the ride without losing the boot. What this reminded me is to always carry some spare parts or even a spare boot when riding. Easyboot used to have a saying, “Carry an Easyboot or get a sense of humor.” That was a time when easyboots were used as spares in case your horse would lose a shoe. My wife completed the last 40 miles of Tevis with an easyboot. These days we have to guard against boot malfunctions as that is the primary form of hoof protection. Even though most of our horses, since they are kept barefoot, would be fine to finish a ride barefoot. It’s nice to have spare parts and be able to fix a boot on the trail when necessary. So what I suggest is as old boots wear out, don’t throw them away! Either keep them and carry them as spares. Or take off the gaiter and carry it with screws as spare parts. Remember though gaiters are boot size specific At the very least a few screws in a pocket or pack could save a nice ride. Also don’t forget the multitool with a philips head to tighten the screws. 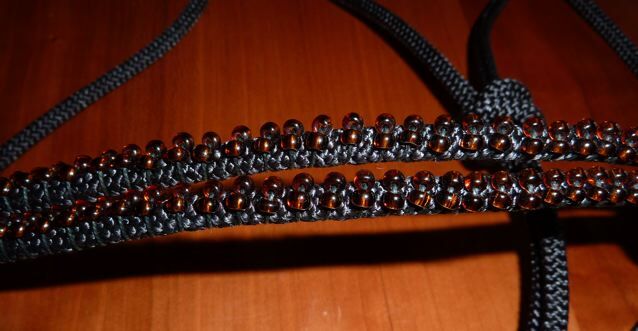 I got a call from a woman in Texas who had seen and used our Max Tack halters. She liked the fit and quality of the rope. She had an idea to add beads to make a functional yet attractive halter. The results look great. 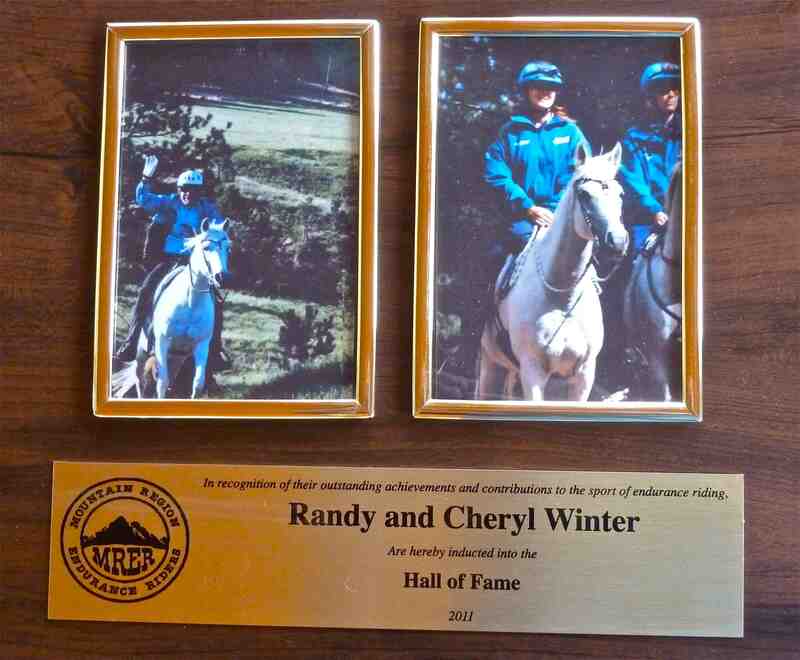 At the recent Mountain Region Endurance Riders convention Cheryl and I were honored by being inducted into MRER Hall of Fame. Thank you to all for recognizing our contribution to the sport over the years. The pictures on the plaque were especially memorable as they are of both of us on our MRER Hall of Fame horse, Riffraffs Raison. To see a slide show of her award presentation click here or on Riffraffs Raison in the menu above.